If you’re currently considering investing in business intelligence software, but aren’t too sure where to start, this guide is perfect for you! Here, we’ll highlight the key advantages and disadvantages of some of the top business intelligence software solutions currently available on the market. Why Invest in Business Intelligence Software? There are a number of reasons why you should consider adopting business intelligence and analytics tools, however, all projects have one common goal – to use business intelligence to turn data into insights and action. Business intelligence software should deliver an increased awareness and understanding of the forces that are currently shaping markets and businesses. This should enable your business to act on this information. Ultimately, by using business intelligence, the goal is to outsmart and outperform competitors, whilst addressing evolving customer needs. Here, we will take a look at some of the top business intelligence software solutions. Tableau Software is one of the industry-leaders when it comes to data visualization software. In their latest version, it’s clear to see that this company has invested heavily in advanced segmentation, clustering and more powerful analytics. This business intelligence software also offers a user-friendly interface and allows non-technical users to create new, customizable dashboards. These dashboards will provide much-needed insight into a broad spectrum of business information. As this particular solution features drag-and- drop capabilities, alongside extensive data source connections, it is a clear front-runner. By adding in data federation that easily scales across a business platform and enhanced mobility support, Tableau continues to impress. QlikView is quickly developing a stellar reputation for developing enterprise-level products that help to deliver top-quality customer experiences. This has enabled the company to extend their market growth and attract new customers to the company. The Qlik Sense product continues to be this company’s lead product, which further strengthens their market position in the embedded analytics, data discovery and stand-alone markets. This company’s main product strengths lie in producing associative analytics that are not achievable whilst using SQL alone, as well as an in-memory engine that can visualize patterns. This memory- engine is scalable, so businesses will easily be able to integrate it with a number of different data sources, which will help you keep track of key performance indicators of interest. Tableau and Qlik are easily comparable as they share a number of strengths and weaknesses. Where Tableau excels at advanced embedded analytics, Qlik lags behind. Both Tableau and Qlik are evenly matched when it comes to the support they provide for SmartData Discovery. However, Tableau easily dominates when it comes to analysis and content creation for businesses. Qlik is more advanced in embedding analytic content and offers a more streamlined approach when it comes to embedding advanced analytic content across multiple platforms. Plus, Qlik also has the edge when it comes to administrative tasks and security. 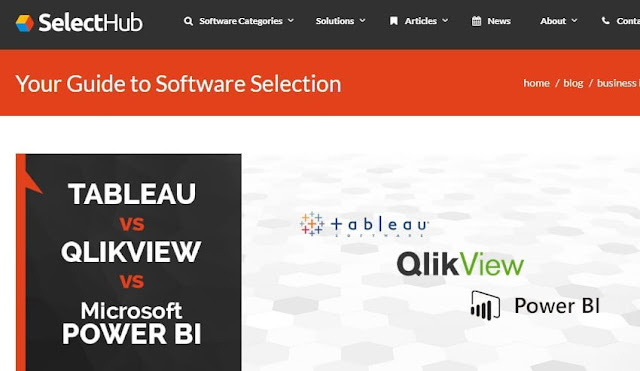 If you’re looking for business intelligence software that is extremely easy to use, then Tableau is a safe option, whereas enterprises that rely on a wide variety of data integration should consider using Qlik. I hope you enjoyed this article about the top business intelligence software solutions in the marketplace today for your company.